If you went clubbing in the 90s and the 00’s then make sure you are part of The Ultimate Clubbing experience being held in Kavos, Corfu in 2019. From Sept 26th to Sept 30th some of the scenes biggest Brands come together to create a completely unique party experience. 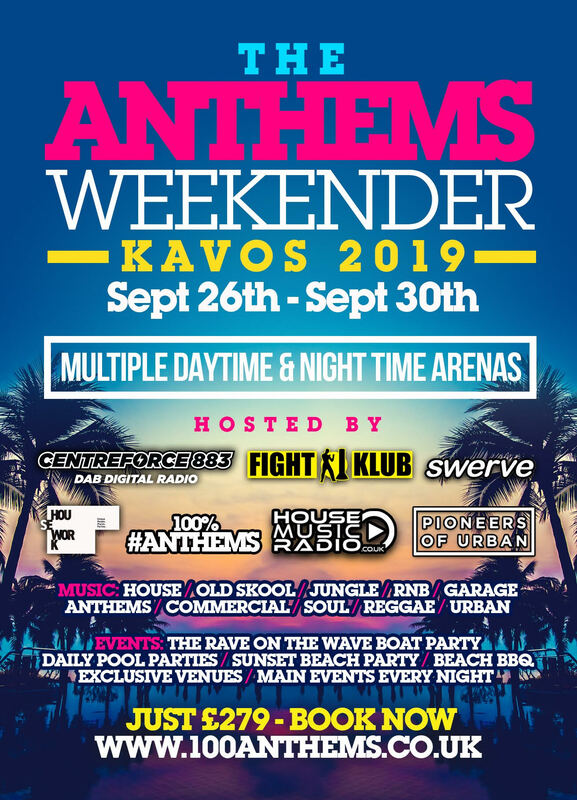 Join the likes of Centreforce, Fightklub, Swerve, Groove Connection, Housework, Pioneers Of Urban, House Music Radio & 100% #Anthems for 4 days and 4 nights of hedonistic clubbing. Headliners include Alex P, Slipmatt, Jumpin Jack Frost, Fabio, Bailey, Gracious K, Fumin, Master Pasha & Pasha, UK Soul Sensation Nate James, Matt May, Kiss FM’s Jason P, DJ Shabz, LexBeatz plus our dedicated Anthems residents playing everything from House, Old Skool, Urban, Soul, Reggae, Jungle, UKG and Club Classics. Included in your package: Accommodation, multiple daily pool parties, fitness pass, main events every night, BBQ’s, Exclusive Beach Party, plus the legendary RAVE ON THE WAVE BOAT PARTY! 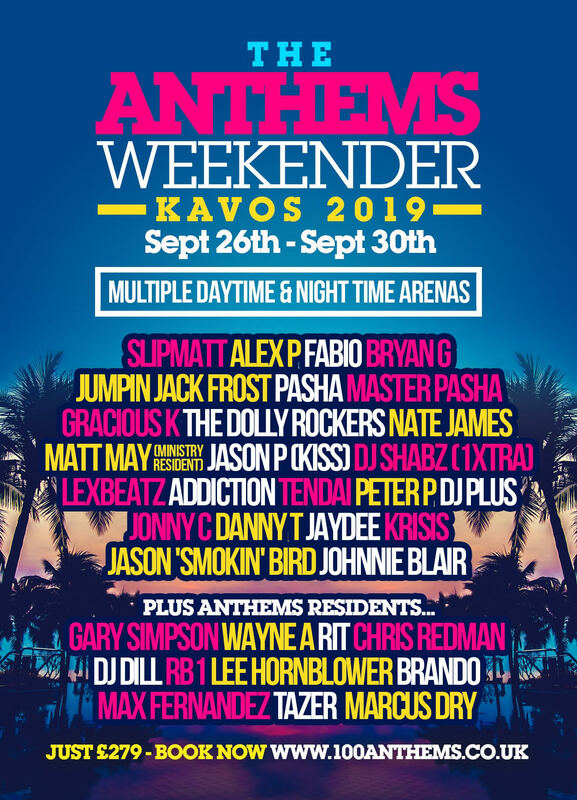 The Kavos Anthems Weekender is JUST £279 with easy payment plans available – BOOK YOUR PLACE NOW!